Welcome Everyone to Kimi's Baby Shower Blog hop! If you arrived here from Tanya's blog then you are in the right place. If not and you would like to start at the beginning please click here to go to Pam's blog. We all did layouts for a baby album for Kimi. I choose the pregnancy page where Kimi can add pictures of her belly or ultrasounds! :) Hope you like it Kimi!! Thanks for playing along in the baby shower blog hop for Kimi. OMGsh.. I LOVE your LO Candace!! Thanks for helping us make this a great baby shower for Kimi!! Oh, such a cute layout! So happy to be a part of this hop with you! Thank you so much Candace for your time and talent - I love the preggie gal.......cyberhugs to you always! Very cute, love your layout! I love how you made the papers work together so well! This layout it top notch! I love it! The pink, green and black is a great combo! awww...loveee the colors you used! and love that cricut cut...she is sooo adorable! Kimmi will loveee this..sooo awesome of you girls! What a great idea. It will make a nice addition to her album. Candace! What a beautiful layout and great idea to add a pregnancy page! Kimi is going to absolutely love it. I love every detail of it. Thanks for joining us!!! 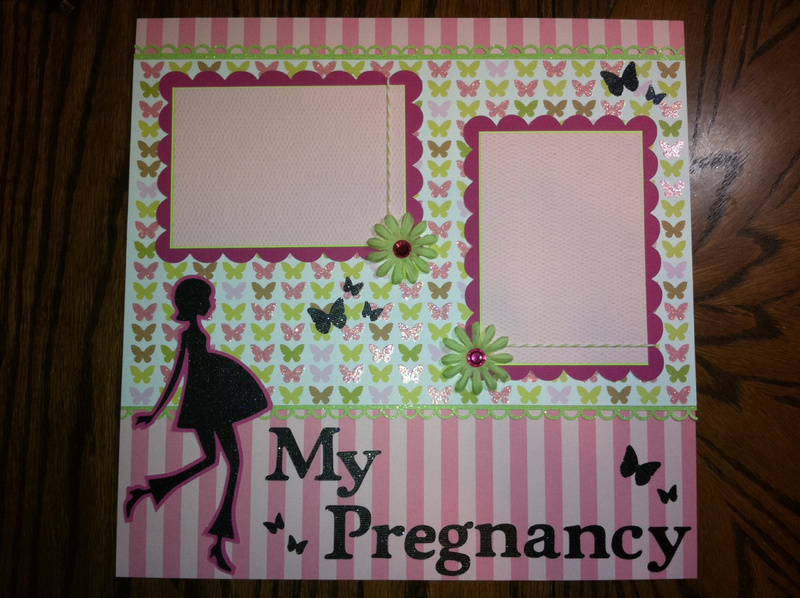 I absolutely love love this layout..
Love the pregnant lady...so cute!! This hop is great. Giving me some great ideas for my daughters album. Your layout is beautiful!! I'm know Kimi will love it!!! I love this LO-----and I am sure Kimi will too. So very pretty and fun!!!! I don't know how I missed you before, but I'm now following by e-mail! TFS! You did a fantastic job! I love the layout! I follow by email. Adorable layout! Thanks for the inspiration. I'm not even pg and I want this page for my scrapbook. Great job, so pretty. very cute layout! great hop! Candace this is adorable!!!! Did you sew the edges??? If I ever get to be prego I need a page just like this!!! What cart is the girl from?